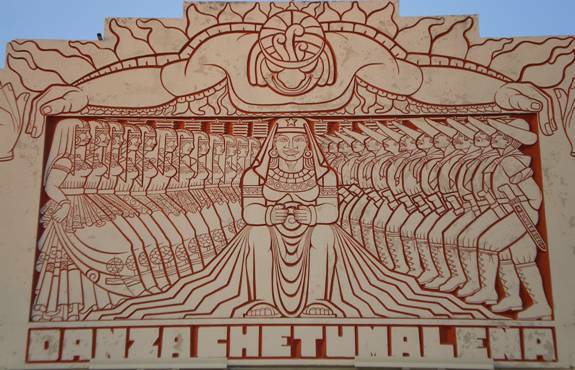 Chetumal, Where the Mestiza was born. political strife and protracted war. No sooner did the Caste War conclude and the Mexican Revolutionary War commenced. 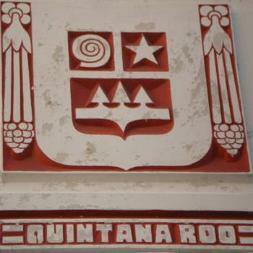 a socialist-populist movement that brought in a very popular social reformer named Felipe Carrillo Puerto. ultimately brought about social reform. cemetery by a firing squad in January 1924. Mérida railroad line at Peto. 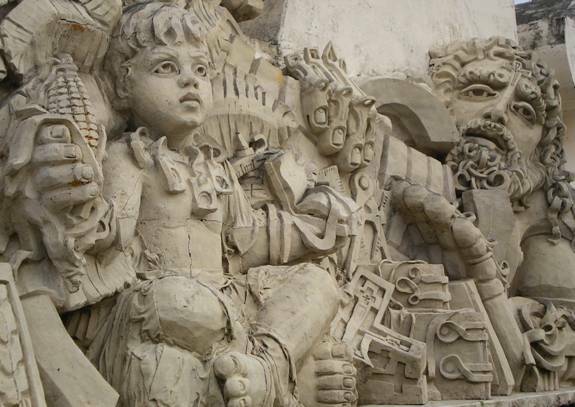 A close up look at Rómulo Rozo’s creative stone relief work in the amphitheater. 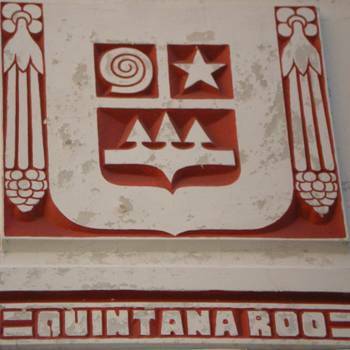 The impeccably kept Chetumal Socialist School stresses the arts and has active community involvement. 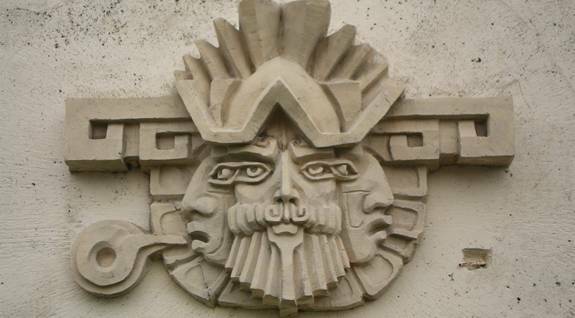 with hundreds of Rómulo Rozo’s stone sculptures. folkloric ballet to this day. are so numerous it is nearly impossible to count them all. Rozo’s is still used to this day on this new entry sign. 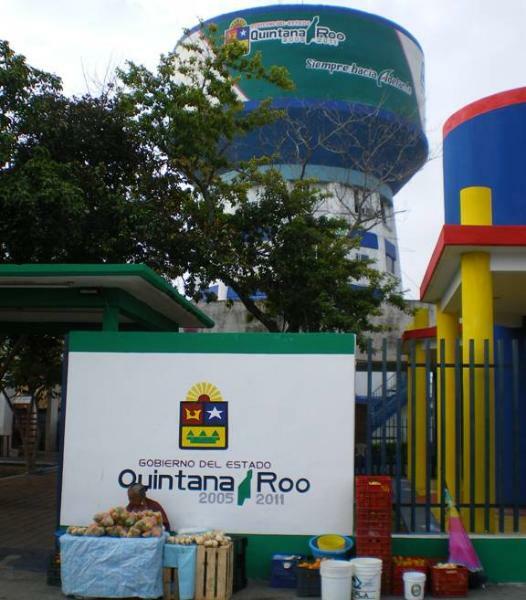 This has to be the cleanest town in this part of the world and check out the meticulously painted buildings. The Mayan lady above is selling tropical fruit from her own garden with nearly no infrastructure expenditures. 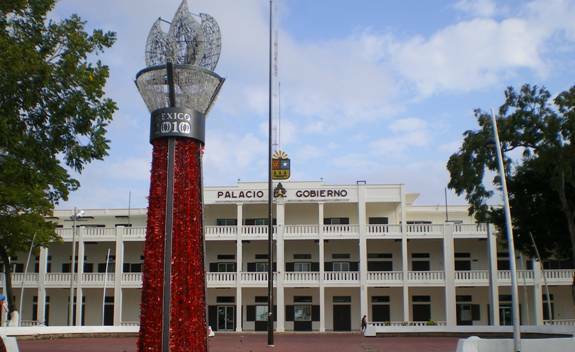 Public pride is evident throughout the city of Chetumal and is apparent in this inner courtyard of the Socialist School. 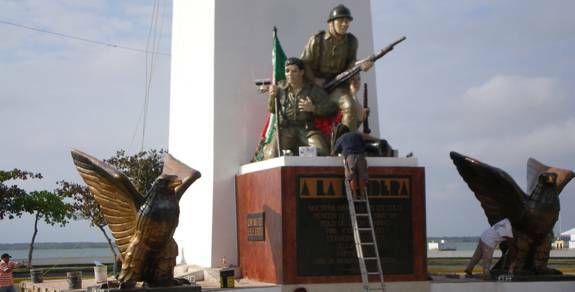 strikingly similar to his work on the Monumento a la Patria on Paseo de Montejo in Mérida. fighter from the Caste War. 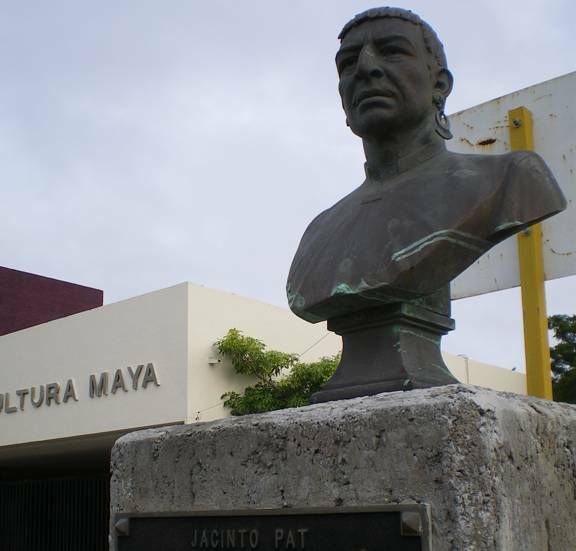 If you miss this museum you have missed a key component of Chetumal. This intriguing street art definitely compliments this well kept place of civic pride. 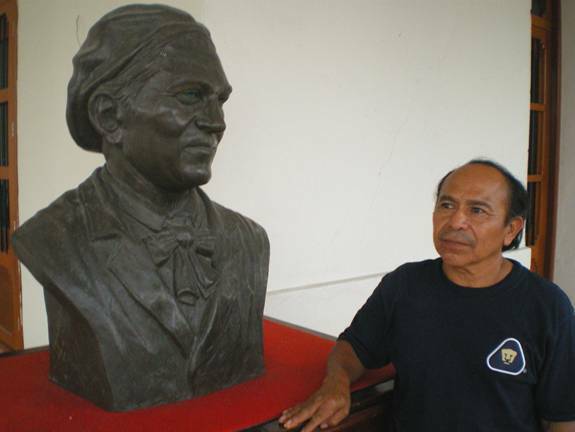 This sculpture of Gonzalo Guerrero is a part of the monument in Chetumal dedicated to the Cradle of the Mestizo. power in it that seems to take on a life of its own. Caribbean Sea at its doorstep. immense bay is too shallow to allow sea going freighter traffic. 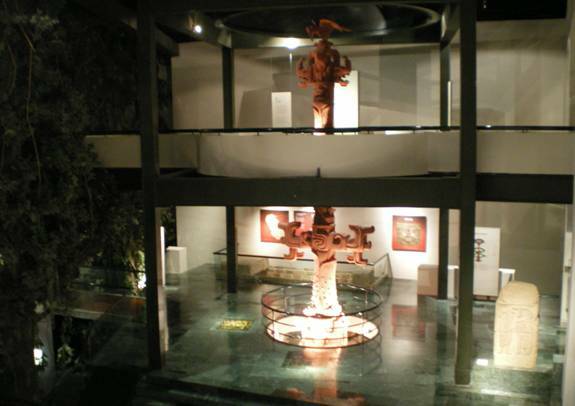 Bravo, the Mayan capital before Chetumal was founded. 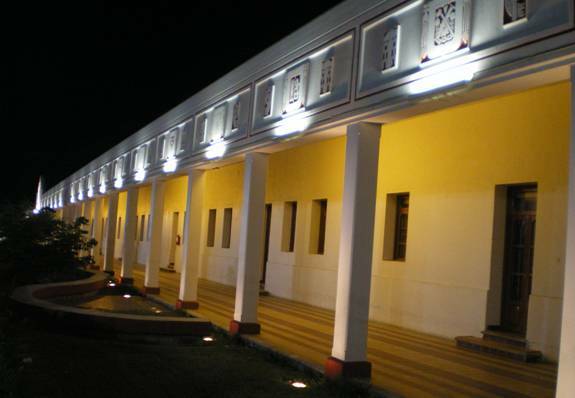 have been recently restored and contain a significant amount of Spanish conquistador early dwellings. some of the best preserved frescos.